The Predator is a boot which has previously set standards and carved a legacy within the footballing world, at the forefront of innovation and tech, it's time for a new chapter with the adidas Predator 19.3 DBZZ FG Football Boots in Gold Metallic, Silver Metallic and Collegiate Navy. Back to make history once more this Football Boot is based on the prototype concept from former, Australian, footballer Craig Johnston has set standards since 1994 but now it's time for a new concept to take centre stage with the Predator 19.3. This updated classic has taken inspiration from the iconic Predator models whilst being thrown into 2018 through modern tooling and innovation. Be sure to pull the strings during any match. This updated classic takes a completely new path, taking influences from the original with brand new and innovative technology. These boots include an updated stretchy sockfit collar. With a Primemesh knitted upper that provides a supportive heel-to-toe fit for an enhanced feel and total control, these boots are lightweight and comfy. These adidas boots provide precise control whilst the Controlskin helps the wearer to keep the ball exactly where you want it in all weather conditions. These boots have a moulded heel which offers a snug feel whilst allowing for natural motion with Total Control stud alignment for high-speed control and stability on firm grounds. The 19.3's have a lightweight but aggressive looking Sprintframe outsole. These adidas Predator 19.3 boots feature a Gold Metallic, Silver Metallic and Collegiate Navy colourway. This Predator is inspired by David Beckham and Zinedine Zidane, hence DBZZ. These two icons are to adidas Predator what Cristiano Ronaldo is to the Nike Mercurial. Celebrating the two legendary players and the 25th anniversary of the debut of the Predator the German 3 stripe brand have launched three limited edition boots. 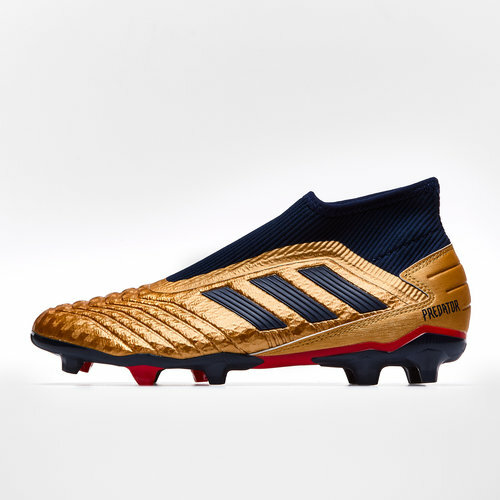 Influenced by the two idols' respective signature remake boots the new predator 19+ and 19.3 are predominantly metallic gold with silver metallic 3 stripes whilst the collar and rear of the boot are collegiate navy. Inside the collar is red as is the sole plate. The front of the tongue on these boots features the initials of the two superstars with DB on the right shoe and ZZ on the left.